One thing that becomes immediately apparent at first glance is the superiority of the image seen on the Butterfly. As we've seen before across numerous Xperia's dating all the way back to Sony Ericsson, the screens tend to have pretty poor viewing angles, but this time Sony didn't get the contrast right either. 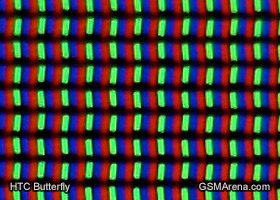 The Butterfly has a Super LCD3 screen and the Xperia Z has a TFT screen with the Mobile Bravia Engine 2, both of full HD (1080 x 1920) resolution. They are both laid out in a full RGB stripe. While both displays are of the LCD variety, the Xperia Z performed markedly worse compared not only to the Butterfly, but to other displays as well. While neither device can compare to the deep blacks of AMOLEDs, the Butterfly does well with a rating of 0.45 cd/m2, against the poor 0.70 cd/m2 for the Xperia Z. When it comes to contrast ratio, anything above 1000 is usually good enough unless you're in a very dark environment. Things are once again bad for the Xperia Z here with a score of 705, while the 1104 put up by the HTC Butterfly is notably superior. The superior contrast is also garnished with livelier colors, so everything comes punchier on the Butterfly screen than on the Xperia Z display. One other factor that comes into the picture in regards to contrast ratio is screen reflectivity. The Butterfly's Gorilla Glass 2 screen is made of a more reflective material than what the Xperia Z uses, which means that regardless of its inferior contrast, the Sony screen does better outdoors. As far as display sharpness goes, both devices have screens of equal size and resolution, with pixels arranged more or less in the same way and both resulting in a pixel density of 441 ppi. Winner: HTC Butterfly. 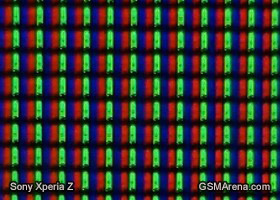 The Xperia Z display is a distant second when it comes to viewing and contrast - it's even worse than most of the 720p we have seen in those two aspects. Two weak points are way too many for a flagship screen and the slightly superior sunlight legibility doesn't even come close to making up for that. The HTC Butterfly features a 2020 mAh Lithium Polymer battery, while the Sony Xperia Z has a 2330 mAh battery of the Lithium Ion variety. While at first instinct it is tempting to assume that the higher capacity will result in longer life, it's not simply question of numbers, as our tests will show. A quick side note first. The Butterfly uses a Li-Po battery, which supposedly will last more charge cycles than the standard Li-Ion found in the Xperia Z. That's good to know, because putting a fresh battery in either device is no easy task and will probably require a visit to a service center. Voice calls are just one of the many features of a modern smartphone, but still an important one. 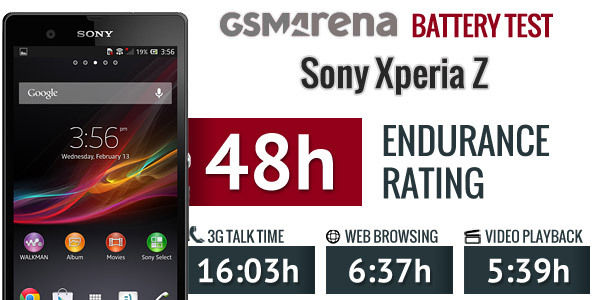 The Sony Xperia Z posts one of the best times we've seen - a whopping 16 hours of talk time before the battery runs dry. The Butterfly did pretty well with over 12 hours of continuous talking before running out of juice, but that's only good enough to second place here. In our web browsing test, both devices came in about even at around 6 and a half hours. Those aren't scores to brag about, but the large high-res screens certainly take their toll on the battery. Other than web browsing, watching videos is the next area where a big screen is of major benefit. If you're on a long commute or on a plane, for example, the HTC Butterfly will last for nearly 8 and a half hours before the battery hits 10% (many phones refuse to play video below that threshold, so that's where we end this test). That's enough for quite the movie marathon on a long transatlantic flight (note: we do the test in offline mode). The Xperia Z failed to match that time. It only took 5:39 before the battery meter showed 10%. Although codec support between the two devices is generally the same (the only real problem the two share in common is the lack of AC3 audio support), it's kind of a mystery as to why the Butterfly does so much better. While you probably won't watch videos on the HTC device for 8 hours straight, you can watch a three hour movie and have plenty of battery left over. Doing the same on the Xperia Z will leave you with less than 50%, even if you started on a fully charged battery. When we tally the numbers and take standby efficiency into account, the Sony Xperia Z lasts two full days on a single charge in a usage pattern involving an hour each of calling, web browsing and watching video per day. Despite its poor video playback endurance, the Xperia Z showed better standby efficiency than its competitor, which helped it achieve an important victory here. 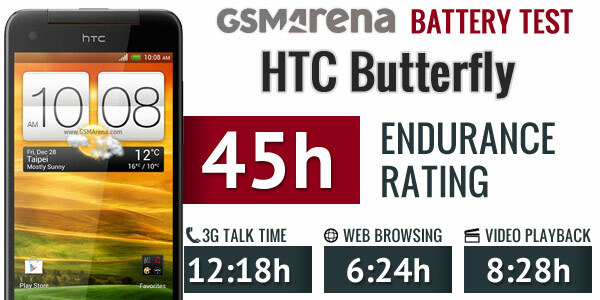 In comparison, the HTC Butterfly comes in just short of the two day mark, with a rating of 45 hours. It has some great overall performance across all three of our tested categories, but it seems that Sony was able to do better when it comes to keeping your device in standby mode. Not to mention that the Xperia Z also offers a Stamina mode, which boosts stand-by efficiency even further. 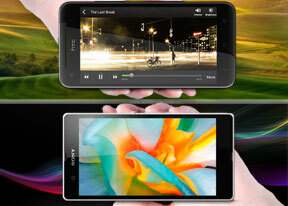 Winner: Sony Xperia Z. If you plan on watching a lot of videos on your smartphone, then the HTC Butterfly has the edge, but the Sony Xperia Z has the upper hand elsewhere and that's without taking advantage of its home-baked Stamina mode.